The 296 guest rooms are shared across two room types – shared and private with Glam Shared offering four bunk-style rooms exclusively for female travellers. The rooms feature unhostel-like complimentary extras such as hair dryers and bathroom amenities. 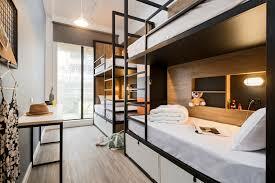 Groups of travellers seeking privacy can book out private guestrooms, with double-, twin-, four- or six-bed configurations available. Each room features an en-suite bathroom and offers free wifi, air-conditioning, reading lights and USB charging stations. “Our aim is to rival the service standards and amenity offerings found in most hotels,” he said. GCP Hospitality runs 39 properties worldwide and has regional offices in Bangkok, Beijing, Hong Kong, Perth, San Francisco, Singapore and Yangon.